Stu McNay and Dave Hughes (USA) sealed gold in style in the Men's 470. 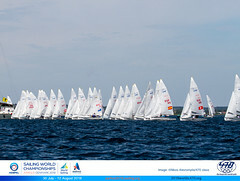 They took a comfortable Medal Race victory to finish 21 points ahead of Mat Belcher and Will Ryan (AUS). "It feels awesome and it is a good return for both of us and a great way to close it out," commented Hughes. McNay added, "We have been knocking on the door for a while and it is great when hard work pays off. We have been sailing a lot and working with each other a lot in this and other classes and it feels good to close out this regatta." The Americans have been consistently at the top of the pack throughout the week with only a 17th looking out of place from eight top five results. 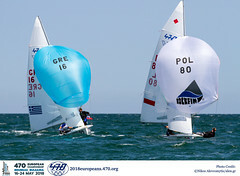 Mat Belcher and Will Ryan (AUS) finished eighth in the Medal Race to take silver whilst Panagiotis Mantis and Pavlos Kagialis (GRE) advanced to third overall after Sime Fantela and Igor Marenic (CRO) finished tenth in the Medal Race. The last time Hannah Mills and Saskia Clark (GBR) and Jo Aleh and Polly Powrie (NZL) did battle in a Women's 470 Medal Race in Weymouth and Portland it was for the London 2012 Olympic Games. Aleh and Powrie came out victorious then but the roles were reversed at the ISAF Sailing World Cup regatta. Mills and Clark stayed ahead of the Kiwis throughout the duration of the race and with their fourth, compared to the Kiwis fifth, they sealed the deal. "I think we still feel gutted after the [Olympic] Games that we basically lost control of that race and it was a bit passive and there was no race," commented Clark. "We were definitely up for a fight today and having a good race and a good battle. We were strict on ourselves about what we wanted to do and we managed to pull it off." 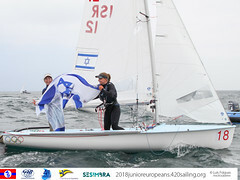 Aleh and Powrie were forced to make do with silver whilst bronze went the way of Tina Mrak and Veronika Macarol (SLO) following a second in the Medal Race.